Recovery Rate Flesh: 35% of total weight, Tail meat: 33% of total weight, sometimes up to 42% Large rocklobsters have massive bodies and yield proportionally less meat in the tail. Western rocklobsters are mostly exported due to the large production, and less than 10% is consumed in Australia. Tropical rocklobsters are considered the best for sashimi. Do not buy uncooked, chilled rock-lobster as it is hard to know how much time has passed since it died. Grading Grading can vary by supplier and region. An example of a grading system for rocklobster is presented below. Some of the smaller grades may be unavailable because of minimum legal size restrictions. Flesh Colour Translucent when raw. When cooked, the flesh is white and opaque with orange tinges and the shell turns red. 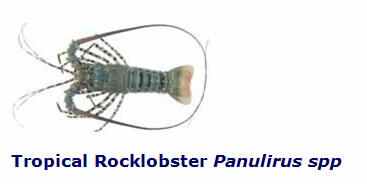 Price Rocklobsters are highly sought after and therefore often highly priced. Price is usually a reflection of available supply, not quality. However, export grade rocklobster is always of high quality and high price. Edibility Flesh is found mainly in the tail. The legs of large rocklobsters also contain flesh. Carapace (or spiders cleaned cara-pace with legs and antennae still attached) can be used for flavouring soups or sauces and in poaching liquids. For rocklobster thermidor, a flavoursome chardonnay or a wooded sauvignon blanc balances the mustard flavours. Rocklobster Newburg, with a wine and bisque style sauce, also calls for a robust style, while rocklobster served as a salad is best with a delicate riesling..